Major chords are made up of a root, a major third, and a perfect fifth. When a chord consists of these 3 notes alone, it is called a major triad. We will be looking at all the 12 major guitar chords in 3 different positions on the fretboard. Most will be open chords but some of these positions will be barre chords. If you haven't played barre chords or are not comfortable playing them, you can concentrate on the other positions for now. There are many other ways to play these chords, but we are concentrating on the most common ways. Most of these guitar chords are based around the root position of the chord, so if you are playing an A chord, the lowest note is an A. The featured song for this session is 'Hallelujah'... a great Leonard Cohen classic recorded by K. D. Lang including chords and lyrics. The F Major chord is pictured as a barre chord. To play an open F chord, simply omit the barre line and only play the first 4 strings with a mini-barre on the first 2 strings - replace the 4th finger with the 3rd. Remember that the Top E is at the top of the diagram and the bottom E is at the bottom of the diagram. This can also be seen by the different thickness of each string. The fatter the string, the lower the string. Always check the fret numbers when reading the chord charts, as they change quite often. You will find them below every diagram. While you are playing, you can do this quickly by looking at your fret markers. You will find them on the 3rd, 5th, 7th, 9th 12th, 15th, 17th, 19th, 21st and 24th frets. Have you noticed how most of the shapes are repeated, except they are on a different fret. This is the beauty of barre chords. You can play one shape, and by moving up the fretboard one fret, you move up one semitone. The same applies if you move down the fretboard... you move down 1 semitone. You can virtually play all 12 chords of the major scale using 1 shape and just moving up and down the fretboard. You probably wouldn't do this, but you can if you want to. 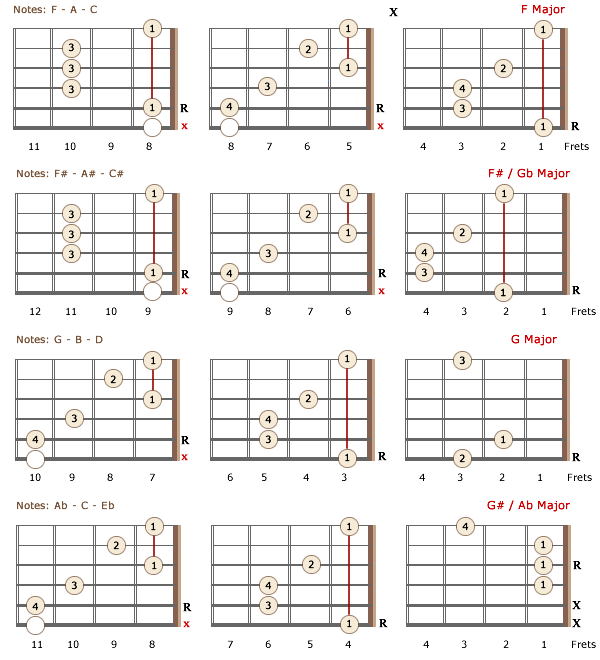 If you can get these major guitar chords under your belt, you are doing very well. As this site grows, we will include more obscure chords which you may be interested in, especially if you are a jazz musician or just love jazzy chords. 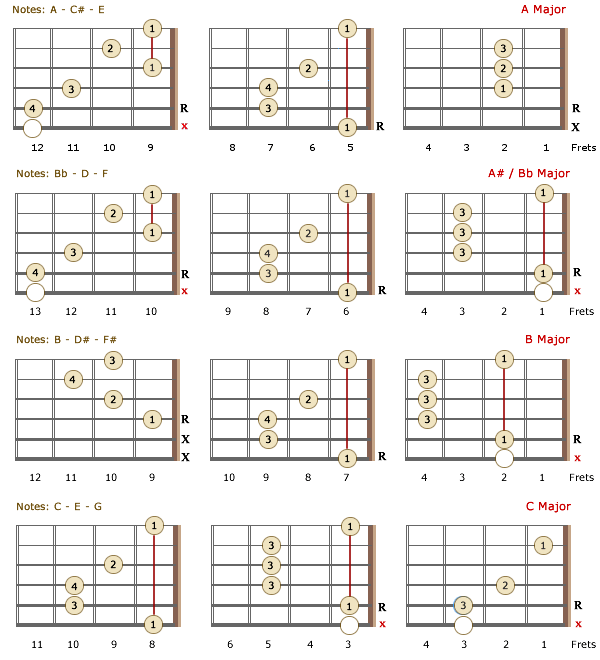 I hope you have enjoyed this section on Major Guitar Chords. Don't forget to put away some time each day to practice your guitar. The more you practice, the more natural your playing will become. You will begin to move smoothly and effortlessly from one chord to the next, up and down the fretboard. Before you know it, you will be a seasoned expert. 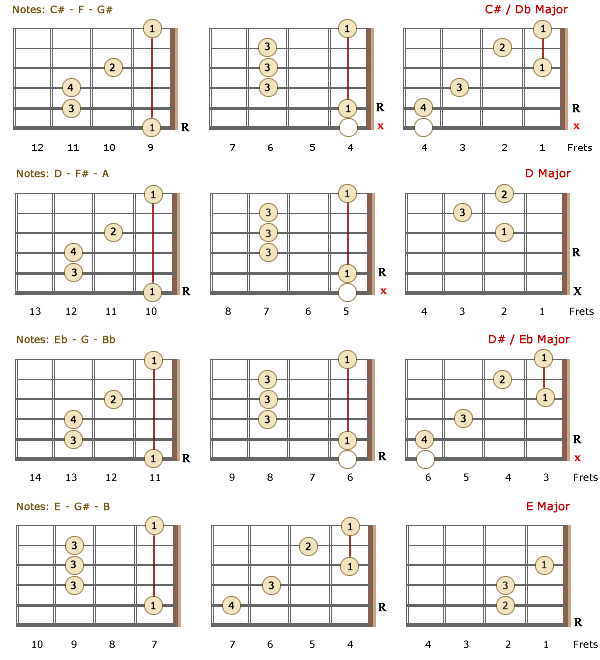 Moveable Major chords: Here you will find a list of major chords with the same shape that can be played all over the fretboard. They include open and barre chords with root notes on the 4th, 5th and 6th strings as well as fifth notes on the 5th and 6th strings... to play these chords you must have some knowledge of guitar notes, and where they are located on the fretboard.